Which Thrilling Adventure Hour Character Are You? Whatever all-American brand you have on tap! Just a milkshake for me, thanks. Why would I drink poison? A knuckle sandwich oughta do the trick! Far from home. It's like I'm on another planet. Penthouse apartment with my wife. Penthouse apartment with my husband. A large house. In Victorian England. What's your preferred mode of transportation? There's an out of doors? Which animal do you identify with most? Is that a comment on my species? A rhino! No, an antelope! Oh no, a cheetah! No, a jaguar! Oh, I simply cannot choose just one! I set my radio's dial for spooky, darling. Are you speaking of those from Earth? There's one or two I will tolerate. Sure. At least it's my job to help them. Not really, darling. But if you pour me another glass, I'm sure we'll be fast friends! So long as the aren't dirty Krauts. They're jolly good, people are. You're Sparks Nevada! You're...from Earth. But as Marshall on Mars it's your job to keep the peace. It also your job to do a lot of paperwork. Luckily, your trusty Martian companion is there to help. Not that you need it. You aren't a control freak or anything. Okay, so you may not understand people as well as you think, but your well-loved by the community you protect. And you do it with a pair of robot fists. POW! You're Croach the Tracker! You might not always understand what the humans are talking about, but they're all right. Some of them. Like Sparks Nevada. Not that you'd hang around with him under normal circumstances. You're under onus, then will return to your tribe. In the meantime you've been deputized, gotten into scrapes with malicious robots, battled giant spiders, and fallen for the Red Plains Rider. You're the Red Plains Rider! In a lot of ways you'd make a better Marshall than Sparks, but you wouldn't say it to his face. Though you're human by species, you were born on Mars (or G'loot Praktaw) and raised by Martians, so you identify strongly with them. You've traveled a pretty rocky road (emotionally, psychologically, and physically), but in the end you found a job and a Martian that you love. You're Captain Laserbeam! When it comes to crime fighting, you're the first person they call. Although sometimes you need a little help from other superheroes. In the meantime, you have your lasers for protection, and thoughts of those counting on you is enough to keep you fighting. After all, what would happen to Apex City without you?! What would happen to the Adventurkateers without you?! That's something we'll never have to find out. Not as long as you're around! You're Amelia Earhart! You aren't so much dead as working for the American Victory Commission. You're a true American, a hell of a pilot, and love nothing more than time traveling to find strategically placed (or timed) Nazis, who themselves have been time traveling through history, and kicking those dirty Krauts back to where and when they came from. You're Colonel Tick-Tock! You defend Queen Victoria from chronological threats. You have a sentient "Trick Clock" that helps you to open time holes and travel through time to stamp out any disturbances. It takes a lot to phase you, but you know exactly the right moment to abandon a certain timeline. And violent altercations aren't really your style, pip pip! 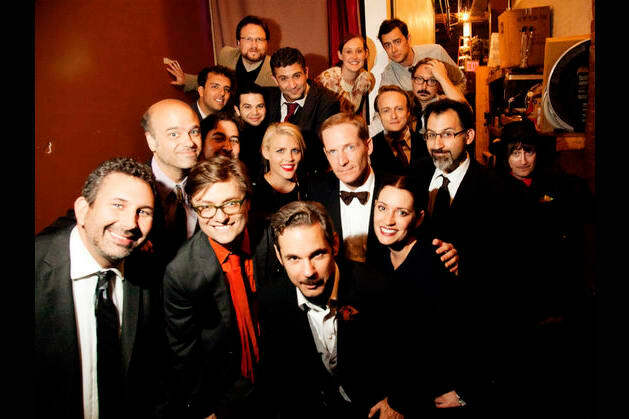 Have you ever wondered where you'd fall in the Thrilling adventure Hour universe(s)? Well, here's a quiz to help you find out.